We’re just in the planning stages of Free Art Friday 2010 (provisionally 22nd Jan 2010) More details very soon. Thanks to the makers, finders, bloggers, snappers that made Dublin’s first large scale FAF a success! Are there any piece still out there? Yes, there is. There are a limited number of paintings and prints in Dublin still in place, but they are in quiet lanes and places you may not expect. We will have a nationwide 32 county Free Art Friday later in the year. Meanwhile have a look at out gallery here on flickr. Today is Free Art Friday! And the people of Dublin are snapping them up! I was out this morning at 7am and placed about 40-50 pieces. Of course because of RTE news last night, lots of people are aware and some pieces last minutes in their location, others pieces are in smaller lane and streets. Next wave of art was at noon and it’s was completely crazy! Everyone knew about FAF, so no matter how subtle I was about placing the work, it was spotted in minutes/seconds in many cases. An Irish Times photographer came along and we couldn’t get a street shot of a painting without two or three people pouncing on it. Okay, we’re two days away from FAF and the critical question is… What’s the weather gonna be like? Well, according to Met Eireann Friday 23rd, we can expect a cold day with sunny spells, (some showers). Of course we’ve planned this stuff in advance so if it’s lashing rain you can expect to find FAF art in sheltered areas such as, a bus seat, door way or phone box. Basically, anywhere public. If the weather is good then, you’ll find them on; park benches, window ledges, railings and you can even expect to find one piece in a sitting on a cinema seat just waiting to be found. Now on to the art it’s self. Wow! 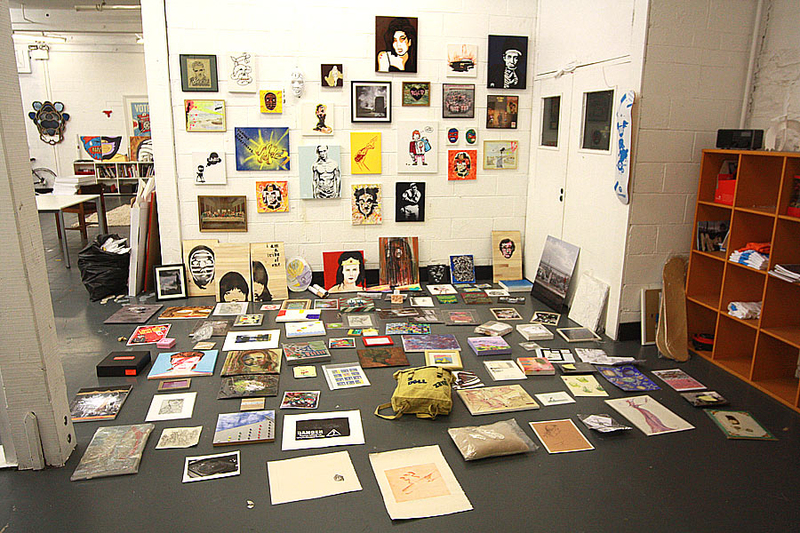 We got screen prints, sculptures, drawings, oil paintings, kids painting, graffiti, Tags, films on CD, embroidered cushions, photographs and illustrations. I’ve been blown away by the generosity and enthusiasm. I can tell you that there will be(fingers crossed) a news item on RTE about FAF on Thursday and I’m talking on the Arts Show on RTE Radio 1 same night. Expect to see the work here and on our FAF flickr page late Friday evening.